The Global Burden of Disease and Injury Series details and analyzes global patterns of death and disability, providing a bold, comprehensive examination of the state of the world’s health. The Global Burden of Disease (GBD) provides systematic epidemiological estimates for an unprecedented 150 major health conditions. Its methods and results are presented here, including: disaggregated death and disability data; projections to the year 2020; and risk factor evaluations. 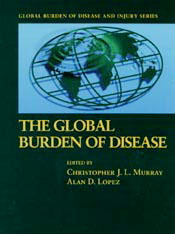 While it minutely examines causes of death, the GBD is unique in its inclusion of disability. The authors explore the technical bases and moral implications of incorporating social, physical, and mental disabilities in health assessments, explicating the indicator they have developed, the disability-adjusted life-year (DALY). The GBD provides indispensable global and regional data for health planning, research, and education. Among the study’s results: Depression was the fourth leading cause of disease-burden in 1990 and by 2020 will be the single leading cause. Injuries cause over 15 percent of death and disability. HIV will by 2010 inflict as great a burden as the age-old epidemic tuberculosis. By 2020, tobacco use will account for 9 million deaths annually. Ultimately, pneumonia and diarrhea, both primarily diseases of childhood, will continue to inflict the greatest health burden of all.